Step 2. Got my paint. I decided on some colors and this past weekend they were having a paint sale, so I made it out in time to get a few gallons. 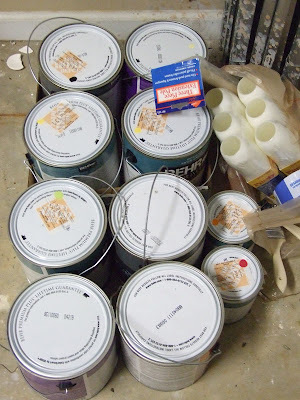 Geez, that's a lot of paint, which equals a lot of painting. I have decided on yellow for my walls and black for my cement floor. I then bought, red, lime green, and orange for accents. I have a loose plan in my head but I am sure it will come to me. I am also sure it will look like my beads. I am really excited to get started. I have a lot of logistical stuff to do before I get to paint. First, I have to move my packing station into my glaze studio. Part of the deal was Nik was getting a work spot in the garage, I really do take over the house. I am lucky to have an understanding guy. Second, I have to get everything out of the new studio space which right now is Nik's office. That's going to take some doing and I am hoping to get some of it done this weekend. Third, I have a moose and hunting scene border in the room that has to come down. Once the room is empty I will take some photos of the "before" to show you. To a completely different subject now....I am experimenting here. I have been knee deep in the holiday stuff, working on my ten projects which is turning out to be about twenty. I am having fun but I really need to take a break, step back, and get some fall stuff made. I sent out a newsletter yesterday, with some Halloween inspiration. I really like making my Halloween beads and better I like to design with my Halloween beads. I realized I am so wrapped up in Christmas that I was missing out. 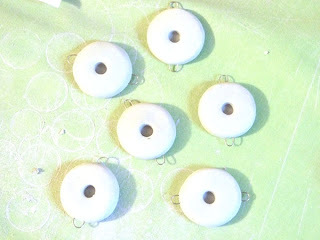 At the same time, I signed up to do Ornament Thursday for thee Art Bead Scene blog. This months theme is Brew. I thought I would play around and come up with a fun and not so usual beads for the occasion. I love being given the chance to experiment. So here is my start, some links. They will go int the bisque today and I will glaze them, probably this weekend because I will be too excited to wait until Monday. I will show you what I come up with.